The new partnership between Saglietto Ceramiche and Tulipano Arredamenti offers our clients a wide range of products for every environment in the home and presenting and suggesting exclusive modern design brands. The Imperia Province Order of Architects in partnership with the Imperia Chamber of Commerce have organized a meeting with the architect Benedikter, an expert in the CasaClima field, to talk about upgrading the energy efficiency of existing buildings. 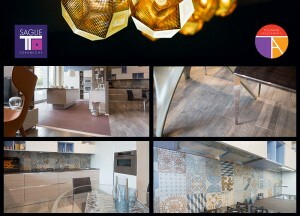 Saglietto Ceramiche took part in the event as the main sponsor in collaboration with Ceramica Cotto d’Este. In collaboration with the Imperia Province Order of Architects, on the 6th of May Saglietto Ceramiche organized a visit to the Antonio Lupi plant, a leading international company in the field of bathroom furniture and fittings.